This footage was captured in 1993 during the late spring at Shimerville, PA, and also the early fall in Oklahoma City, OK. Hoffman was supposed to be taking it easy, nursing an injured shoulder and awaiting surgery to repair the damage. I guess Mat’s idea of taking it easy is busting bar-hop airs, nailing a double tail-whip to the pedals, and getting towed by a motorcycle driven by Steve Swope straight at a 21 ft quarter pipe. Happy 46th Birthday, Condor! . . and speaking of Steve Swope, he has a a super-rad vert run in this section. Other riders include Jon Peacy, Taj Mihelich, Dave Friemuth, Leigh Ramsdell, John Parker, Joe Rich, and Dave Clymer. 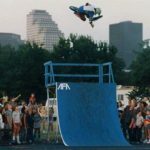 We’ve already posted sections from: Dennis McCoy, Jay Miron, Dave Mirra, Luc-E, Chase Gouin, and the 1st and 2nd mix section. And if you haven’t read about Tony Marion and this classic lost video, you can check out the article here. 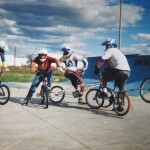 This entry was posted in Video and tagged Dave Clymer, Dave Freimuth, Joe Rich, john parker, Jon Peacy, Leigh Ramsdell, Mat Hoffman, steve swope, Taj Mihelich. Bookmark the permalink.